Portion salmon or leave in whole fillet. Sprinkle liberally with brown sugar. Drizzle with soy sauce and marinate for approximately one hour. Transfer to baking sheet, reserving liquid. Season with lemon juice and pepper. Bake at 350° until desired doneness, basting with reserved liquid. 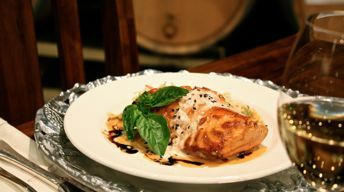 To serve: divide salmon between 6-8 individual plates; drizzle with soy beurre blanc, ginger cream and Asian slaw. In small, stainless steel pot, reduce vinegar with chopped shallots to about 1 oz. Add Chateau Ste. Michelle Chardonnay and reduce again to 1 oz. Add cream and bring to boil. Remove from heat and whisk in the butter. Add soy sauce. In small sauce pot over medium-high heat, reduce chardonnay and pickled ginger by half. Add the cream and reduce to sauce consistency. Strain out the ginger or leave if you wish. Place sugar through mint in blender, puree until smooth. Check for seasonings. Reserve until service. When ready to serve, toss with cabbages, carrots, cucumbers, peppers and green onions.